After the class has gone over the common shot compositions and camera movements, find a partner. You will be working in groups of two for this project. 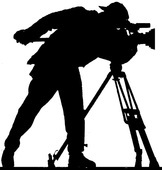 As a team, decide on a theme for your video that will incorporate all the camera shots and movements. Using the on-board camera of the Apple iPad, collect an example of each technique we learned in class. Using a Pinacle Studio App, place a corresponding title that describes each camera movement or shot. Make sure your photo or video is edited usable video and the frame size fills the screen. Finally, add a background song to make your video more interesting to the audience. After you have finished your project, save it as the last names of each group member + tech. Export the media with the same name (ex: pettyfursetech.MP4). Submit the exported video by showing to the teacher. Don't forget to review the rubric to make sure you are meeting all of the project requirements.